We're excited to welcome Howie back to the CMIC stage to launch is latest album "Shades of Tartan". Howie will be joined by Mac Morin, Mary Beth Carty & guests. Howie MacDonald is a legend in Cape Breton fiddling. A performer since a very young age, he grew up surrounded by the music which has influenced his playing over the years. 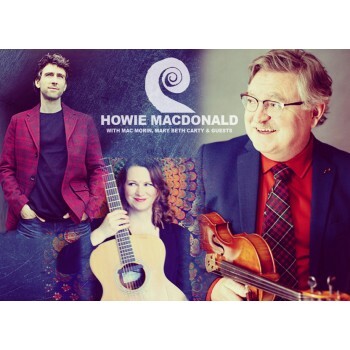 His lively Cape Breton style of fiddling has entertained audiences all over the world. 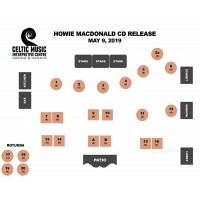 A former band member with the Rankin Family for many years, Howie has released several solo recordings and is also featured on many of the Rankin Family recordings. Doors & bar open at 7:00pm. All tickets purchased online or by phone (902-787-2708) will be held in your name for admission on show night. This event is reserved table seating. Choose your preferred table when purchasing. Note: Seating image is not updated online when tickets are sold.